With the success of the first part in the trilogy of Hobbit movies, enthusiasm for all things Hobbit and Lord of the Rings is at a high. The Hobbit: An Unexpected Journey has been a massive hit at cinemas around the world, and kids are head over heels for Tolkien's fantasy world. Lego have jumped on board this enthusiasm by releasing a bunch of themed Lego sets that tie in with the film. 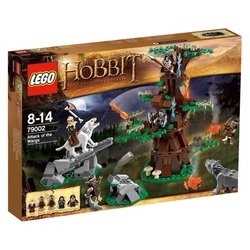 This set recreates the memorable scene in which Thorin and Bifur the dwarves fend off some orcs riding on wargs near a precarious ledge. The image on the front of the box is pretty accurate with this set, which is great news since it's an image full of excitement! The box itself contains over 400 Lego pieces, which obviously gives plenty of opportunities for creating new and unique designs if you don't like to follow the instructions. But assuming you do follow the instructions, your child will be pleasantly surprised by a large tree that a figure can hide inside, two rocky outcrops, two campfires, and a total of seven figures. 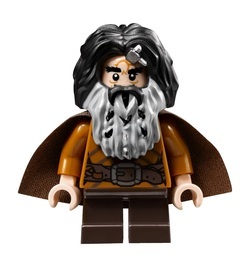 These figures are recognizable as the characters from the film, with Thorin, Bifur and Yazneg being the most interesting. All of them though offer the chance for your child to imagine scenes from the film. 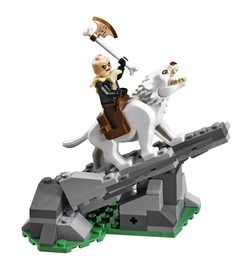 Apart from the variety of pieces, most kids will be pleased to know that there are several weapons included for the characters to wield, and it's also possible for any of the characters to ride on the wargs. 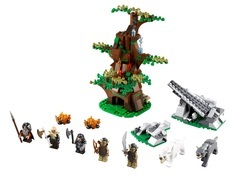 The set offers a good deal of action and excitement that's sure to appeal to both Lego fans and The Hobbit fans. One of the best things about Lego is that it's great fun and encourages imaginative play. So if you want to get your child to play more actively, or just want to make sure they have a great time with their new toy, this kit is a great choice. It's an accurate recreation of a scene from the movie that's sure to put a smile on a young face. Definitely worth the money.